Many times people dwell on the good times they have had during the holidays. Many think of Thanksgiving at their grandparents house. Many think of Christmas with loved ones and the great times they have had. 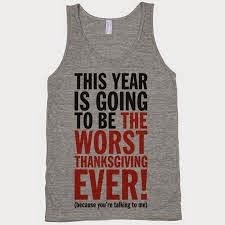 But, there is always that one holiday that sticks out in your mind as worst ever. My worst ever Thanksgiving happened when I was about 16 years old. We were living in Florida at the time. Mama had gathered all the turkey, dressing mix and so forth she would need. Mama would start cooking at about 5AM Thanksgiving Day. She would put the turkey on, the dressing, the gravy and so forth. She usually did this without any help. But, on this one particular Thanksgiving, the power went out about 9AM. The turkey was only about half done, the dressing was not yet put in the oven. In short, my mother was at the mid-way point of cooking Thanksgiving Dinner when the power went out. Since it was an electric stove, she had no choice but to wait for the lights to come back on that morning. We anticipated about a 5 minute wait, maybe 30 minutes if something was really bad at the power company. After 10AM, Mama called the power company. She got a recording. That's never a good sign. Noon came and went. Still no power. Mama was desperate now. She considered taking the turkey out of the oven and putting it on the grill. But, it was so wet and rainy outside, she felt it would be impossible. It was now 4PM Thanksgiving Day. We were hungry since we had not eaten any breakfast in anticipation of Turkey and all the trimmings. People around the neighborhood were gathering at street corners now. We were not the only folks upset with the power company. The "not knowing" what was wrong and when the power was coming back on is what was driving us all crazy. It was now 6PM and it was dark. We had eaten sandwiches and soup for our Thanksgiving dinner. We all thought it was funny except our mother. Mama did not know what to do with the turkey. She decided to put it in the refrigerator. But, she could not find enough space. So, as she was taking things out of the fridge, the power came on just after 7PM. The power had been out for over 10 hours on Thanksgiving Day. Mama decided to put the turkey and dressing in the oven and stay up until it was done. She finished up Thanksgiving dinner about 11:30PM that night. We ate our turkey and dressing the day after Thanksgiving. It was delicious as always. But, it simply wasn't the same. We bragged on Mama for all the hard work she did to have the meal ready for us, albeit a day late. It didn't seem like Thanksgiving because we weren't able to have turkey and dressing on Thanksgiving Thursday. The reason for the power outage? A cat, trying to get out of the rain and cold, got into a substation and shorted out the entire grid to about 5,000 customers on Thanksgiving Day. As bad as our Thanksgiving Day was, it was much worse for a cat that used up all 9 of his lives on Thanksgiving Day many years ago.